Which Presidents Are Right about Government, George Washington and Thomas Jefferson or Woodrow Wilson and Barack Obama? When I was became interested in public policy, I thought Jimmy Carter was the epitome of a bad President. But as I began to learn economics, I realized that Richard Nixon and Lyndon Johnson also were terrible and belong in the Hall of Fame of bad Presidents. And the more I studied economics and public policy, I learned that Herbert Hoover and Franklin Roosevelt were two peas in a failed big-government pod and deserve membership in that Hall of Fame. Or I guess we should call it a Hall of Shame (you can click on the image to see my selections). Whatever we call it, I’m now at the point where I realize that Woodrow Wilson and Teddy Roosevelt are the charter members. Why? Well, because they were the first Presidents to reflect the progressive ideology. More specifically, they shared the ideology of the progressive movement, which saw a powerful and activist central government as a force for good – a radical departure from the views of America’s Founding Fathers, who hoped that the Constitution would protect people by keeping government very small. Not surprisingly, Barack Obama is in that “progressive” tradition, even to the point of attacking the views of the Founding Fathers in a recent speech at Ohio State University. I commented on this issue in this Fox News segment. That short clip only scratches the surface. For more detail, here are some excerpts from a column by Andrew Napolitano. Like me, he isn’t impressed by the President’s statolatry. It should come as no surprise that President Obama told Ohio State students at graduation ceremonies last week that they should not question authority… And he blasted those who incessantly warn of government tyranny. Yet, mistrust of government is as old as America itself. America was born out of mistrust of government. …Thomas Jefferson…warned that it is the nature of government over time to increase and of liberty to decrease. And that’s why we should not trust government. In the same era, James Madison himself agreed when he wrote, “All men having power should be distrusted to a certain degree.” …The reason Obama likes government and the reason it is “a dangerous fire,” as George Washington warned, and the reason I have been warning against government tyranny in my public work is all the same: The government rejects the natural law because it is an obstacle to its control over us. …Because the tyranny of the majority can be as dangerous to freedom as the tyranny of a madman, all use of governmental power should be challenged and questioned. Government is essentially the negation of liberty. Napolitano also warns against majoritarianism in his column, which is music to my ears. Though I’m not sure our battle today is with majoritarianism or the progressive ideology. Our real challenge is redistributionism. Far too many people think it is okay to use the coercive power of government to obtain unearned benefits. And that’s true whether the benefits are food stamps or bailouts. And as we travel farther and farther down this path, it leads to ever-greater levels of dependency and ever-higher levels of taxation. But that simply means more people decide it makes more sense to ride in the wagon rather than pull the wagon. Somehow, we have to reverse this downward spiral. Unless we want America to become Greece or France, at which point productive people may be forced to emigrate – assuming there are still some sensible nations left in the world. George Washington and Thomas Jefferson are more right about this than Woodrow Wilson and Barack Obama. Just my thoughts. I made my own list on this topic a few weeks ago, and it’s almost identical to yours. Although I have Nixon and George W. Bush as good, and Clinton as bad. You have the reverse. Any comment on that? Clinton raised tax rates, and George W. Bush lowered them, which counts for a lot in my book. I’d suggest that those who support redistribution in part base their views on the implicit assumption that the majority gets to do what they want to the majority. Undermining that concept may help undermine their ability to rationalize using that control to redistribute the spoils of their victory over the minority. It is implicitly the philosophy of “might makes right”. It is merely made slightly more civilized by determining at the ballot box that “we outnumber you so do things our way since we could force you if we had to but it saves hassle to count ballots instead of fight”. Its amazing but the google search for “Pitchfork Democracy” returns no hits! Redistributionism is the wellsprings of statism. Sensible nations will exist or form. Human cultural evolution is unstoppable but like in most evolutionary trees most branches go extinct. My fear is that these sensible countries may not be democracies, like Singapore is a quasi-democracy. It scares me that people are starting to move from France to Dubai, because they feel freer! Obviously Obama Dan. Why would you even ask such a silly question. I notice that only the last two rows are marked. Of course there were bad presidents prior to 1900. America seems to be able to endure any bad president (at least so far). 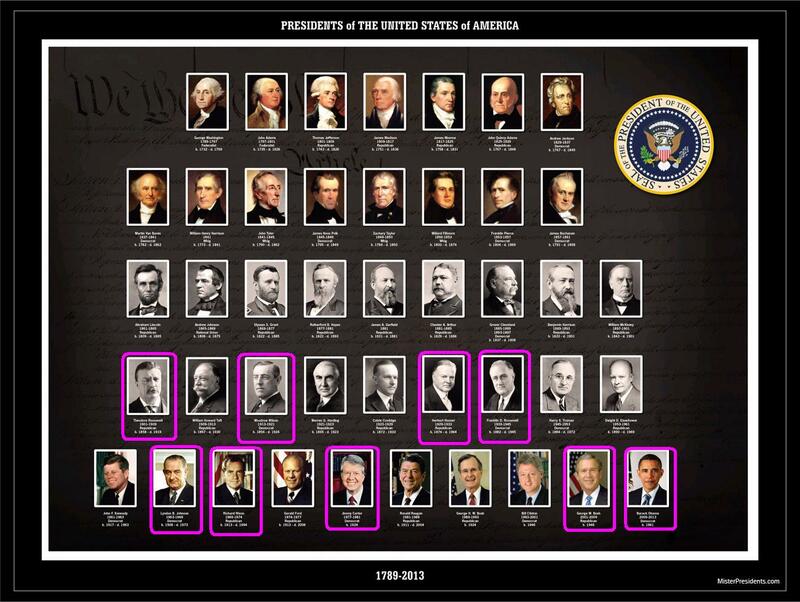 My big concern is that each row has more bad presidents, how many bad presidents in a row can we survive? If your Hall of Fame is based on abuse of government power, the Lincoln has to go in. Even if you believe that the Union was morally right (and I do), Lincoln was the biggest of the big government presidents.